Complete day-by-day plans for the entire year are provided, with assignments correlated to the homeschool grammar, literature, vocabulary, spelling, poetry, and composition grade 8 curriculum (sold-separately). Helping parents to organize and structure their teaching, 170 daily plans for grammar, literature, vocabulary, spelling, poetry, and composition are included, all of which coordinate with the 8th grade Language Arts program. Topics covered include writing research papers, the procedures for writing book reports, diagramming, and more. Organized by lesson, these curriculum/lesson plans also include suggested time allotments, subject descriptions, a scope and sequence, and progress reports. Spiralbound. 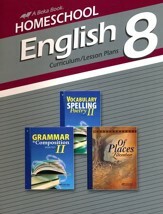 Writing & Composition II for grade 8 features a clear explanation of traditional grammar, composition, and the eight parts of speech; units on manuscript form, the writing process, the library, making an outline, the paragraph, summaries, book reports, writing descriptions, the research paper, and improving writing style are also included. A convenient end-of-book handbook for grammar rules is also included. 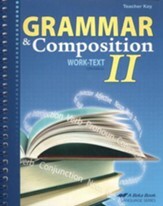 This teacher's key accompanies the sold-separately Grammar and Composition II Work-Text and contains a copy of the student text with answers. Grade 8. Spiral Binding. 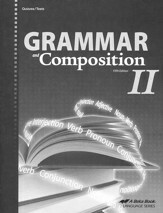 This Quiz & Test Book is part of the Abeka "Grammar and Composition II" Grade 8 curriculum. Providing parents with the chance to assess student progress, it contains 22 quizzes and 12 tests that cover the material presented in the text. It also includes a research paper checksheet, a grade form, and a reading record sheet. Answers are not included, but are sold-separately in the Quiz & Test Key. 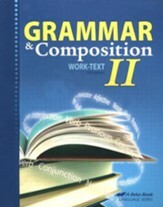 This key accompanies the sold-separately Grammar and Composition II Quizzes & Tests and contains a copy of the quiz and test book with the answers and suggested point values. Grade 8.